A saddle may soon be in my future. 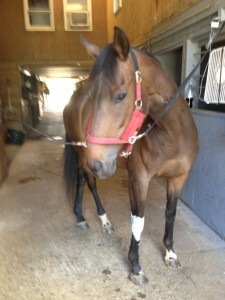 I have an appointment next weekend with Dover to come on down to my barn and try saddles on my pretty filly. 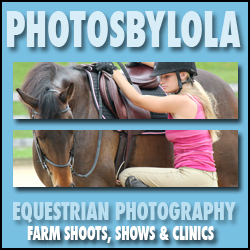 I have very high hopes that this will be it, that I will get a good fitting saddle and actually begin to ride my horse. These last couple months of ground work and a few injuries have bonded me and my girl, she tests me less and less and behaves more and more. But it will be nice to actually start her under saddle properly. Now don’t get me wrong, Jezebel is chocked full of personality and I like that about her, she’s also headstrong and very curious. Also qualities I really like that about her so “not testing me” and “behaving” should be taken with a grain of salt. So if all goes well, next week I will be well on my way to riding. That is IF all goes well I’m crossing my fingers and holding my breath. Of course today when I went to check on my girl I found that she has a bit of a swollen knee, Yesterday I found a cut on her right front just above her knee. Every day another ding, the perils of turnout. As my barn manager says “they are all just accidents waiting to happen”. Today I noticed the knee was puffy, just a touch swollen. 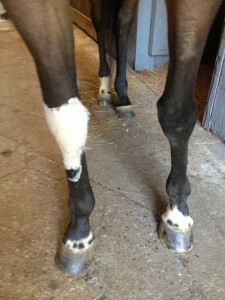 She’s not lame and it doesn’t seem to be bothering her but its a little swollen none the less. So I decided to put a clay poultice on her knee to see if it would help reduce the swelling. I also elected to not lunge her today at all. However I did tack her up and she didn’t dance around much. I figure I better start tacking her up every day until my saddle fitting so that she remembers that shes actually a riding horse, gets used to being tacked up with out dancing around much and doesn’t humiliate me too badly in front of strangers. Yes, a girl can dream.